Moose and elk make appearance in the Rockies | Where to next? I may be sitting on a beach in Peru, but there are some photos of moose and elk that are itching to be posted. Before we headed to South America, we had four fantastic days in Denver Colorado staying with a long-time friend. He loves the Rockies (which are on his doorstep) but hadn’t been there for quite a while. His back was injured more than two years ago, and it has made driving impossible for him. Even riding is difficult. But I can drive, so was quite happy to climb behind the wheel of his Jeep for a day’s outing to the nearby Rockies. To be on the safe side, my friend even renewed the Jeep’s insurance for a few days, so we were all legal. A funny thing happened at the entrance to the Rockies. Park admission is $20 a vehicle (and good for a week), but when we asked if there was a senior’s rate, the woman offered me a lifetime entrance permit for just $10. Only one catch, I had to produce a US driver’s license. You can bet I’ll apply for a license the next time I’m in the US because we’re hoping to do a circuit of the national parks. Anyway, our recent outing was exactly a month ago, and what a lucky day we had. The weather was perfect and because it was a Wednesday, there weren’t hordes of other tourists. But the best thing was the animals. But back to the Rockies and the animals. We took the road to Boulder and on to Estes Park. Our first stop was at picturesque Boulder Falls, and then lunch at the Outlaw Saloon in Lyons. They were so accommodating there. Herbie, my friend’s dachshund, was allowed to sit in the pub’s outdoor area, which is technically a no-no, but we sat far from the main entrance. I had to order a reuben sandwich and beer, even though I was driving. The glass was enough reason to have a beer. Then it was time for a serious cruise through the park for animals. There were plenty of birds—some too quick to photograph and some I don’t recognise. Cute chipmunks were out in force. We spoke to two women who had been driving through the park since early morning and had yet to see any large animals. But less than a kilometre up the road we spotted three elk. Later we even saw two more doing an antler tussle. 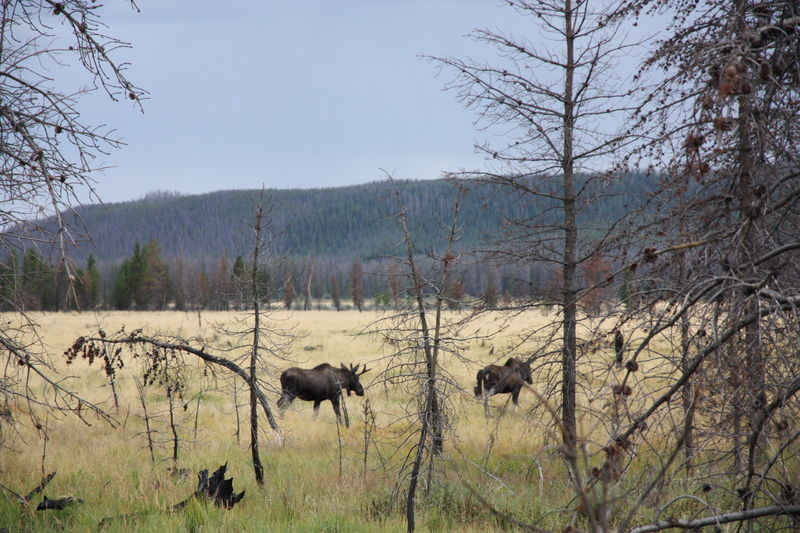 Then the normally reclusive moose appeared, and then even more moose. The first one we saw—a female—had a young’un with her, but the babe was so sheltered in long grass that I couldn’t get a decent photo. In addition to lingering over the beasts, we took a few walks to lookout points. And as we drove from the park, another couple of elk appeared. It was great day, topped off with a rainbow. Such a good day, that I’m wondering if maybe it was a movie set? I’m so glad you were able to get David out of the city. He likes the park but we rarely take the time to go. It always amazes me how beautiful and peaceful it is. So happy you could come for a visit. Thanks Troy. We had such a great day out. So wonderful and rewarding. My brother came into my room and saw me watching your Rockie Mountain photos… he said that the “Moose” one (with the moose in between the trees) was excellent and the other photos. I in turn loved the Rainbow, sometimes hard to get a good photo. Wow Sy, thank your brother for the high praise. I like the rainbow pic too. As you said, it’s hard to get a decent photo of one. I wonder if my UK licence and bus would do? It has to be a US license, but a year-long pass is pretty cheap — something like $50. Poor John and I plan to come back and do more parks. Colorado is such a beautiful state, I lived there for 4.5 years before moving and I tell you, the views alone can take your breathe away sometimes. Not to mention, I enjoy all the outdoors and wildlife it has to offer, I sometimes have to ask myself why I ever left, lol. I am happy that you had the chance to visit and sight see! love the picture. Thanks so much for stopping by. We love Colorado too and hope to return soon for a repeat visit. My kid brother vicared in Colorado for a year; he and his wife adored getting into the national parks any chance they got. 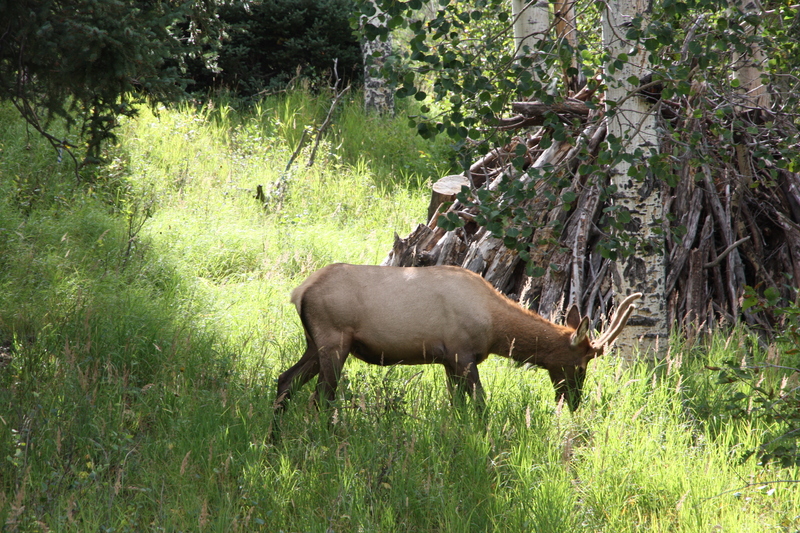 Did you watch the entire elk duel, or only catch a small moment? We watched for as long as it lasted. It wasn’t a full-on duel. But it was fascinating to see them posturing and clashing antlers. I agree! There’s something cool yet unsettling to conflict played out in a shared space as if you don’t exist. You’re a viewer and a participant all at once. Curious feeling. I think the weirdest one was when I was in junior high. Two girls got in a fight in the stairwell. They tumbled down the stairs, kicking, scratching and biting. I was so shocked. It was a rough school and the teachers used to do monthly checks for switchblades in lockers and in pockets. I think it’s calmer now. I hope so. My mom taught on Milwaukee’s north side for a while, and the teachers often had to break up fights among students. No weapons, thankfully, but fists flew far too often.